About a year ago, the polling site Syriapol was launched, created by George Ajjan, a Syrian-American Republican political strategist who has commented frequently on US-Syria relations here and elsewhere. Below is a press release that includes a summary of the first phase of the project, in which most of the 350 poll takers were expat Syrians. George hopes to get more participation from inside Syria in the second phase. Although online polls are usually not as reliable as properly designed polls which try to ensure that their samples are representative of the broader population, George managed to to get closer to the ideal case by targeting Syrians who held various political views by listing a link to syriapol on most of the popular Syrian blogs and sites. This ensured that the sample of participants was not drawn exclusively from Syrians with any specific political camp. 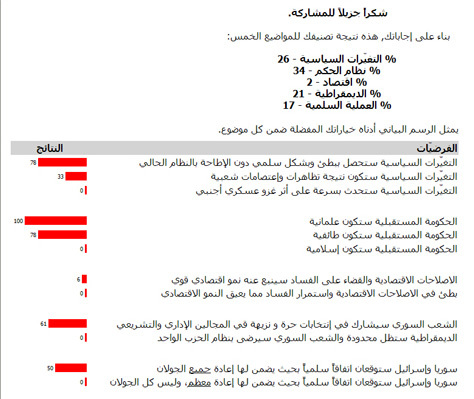 Here is a graphic that shows typical results for one respondent (in Arabic), syriapol’s press release follows. Clifton, NJ, USA – syriapol, a study of Syrian public opinion, today released the initial indications of the first phase of its data collection, in which an online audience composed primarily of Syrian expatriates bluntly rejected an overthrow of the current Syrian regime through foreign military intervention, and expressed support for a secular form of government. The survey’s creator, Syrian-American political activist George Ajjan, anticipates the second, more substantial phase of the project, which would entail greater participation from within Syria, thus far limited due to compliance with US sanctions against Syria. Ajjan, whose family emigrated to the US from the city of Aleppo in the early 20th century, says he created the project to offer more reliable information about Syrian public opinion to decision makers and activists across the globe than the biased propaganda spouted by political operatives, both pro-regime and pro-opposition. syriapol, by contrast, uses a market research technique called conjoint analysis to extract the respondents’ preferences on a series of attributes related to regime change, form of government, economic reforms, democratic elections, as well as the Peace Process, and then immediately provides the results confidentially in a graphical format to the individual participant. According to Ajjan, the survey’s format, in which a participant evaluates a series of 16 hypothetical scenarios, encourages a more honest assessment because it does not ask direct yes/no questions that almost always lead to jaded responses from participants fearful of government spying. As for the results, Ajjan says that the initial indications are interesting, but far from conclusive because about 75% of the approximately 350 respondents thus far do not live inside Syria. He further stipulates that online surveys could never provide a truly accurate picture of Syrian society on the whole, given the low rate of Internet penetration, with the caveat that the syriapol project at least provides some quantitative data to balance a political atmosphere currently filled with little more than spin. All Syrians are invited to participate and learn more about the syriapol project by visiting http://www.syriapol.com (English) and http://www.syriapol.org (Arabic). for more information, contact george@ajjan.com or see http://www.ajjan.com. If this serious undertone is quite prevalent in Syrian Society what would be the catalyst to spark a non violent uprising similsr to the Ukranian Orange revolution and if Syrian society is capable to pull this off? With all the activists like Bunni and Kilo in Jail is there a charismatic figure in Syrian society whose jailing might be the catalyst. Those in the know please feel free to comment. I will disappear again soon 😉 but since I am here, let’s talk! First, please don’t depress me because I used SPSS for one of my graduate research projects, and… I still use it. Is it really outdated?! TO me SPSS is the modern upgrade … I used to use SAS before… on VAX computers .. the ugliest computing experience you can imagine. You are right that there are probably serious differences between the set of Syrians living outside, and those living inside Syria. You can assume that the sampled population for this initial stage of the experiment is Syrian expats, and therefore we should discuss any conclusions keeping in mind that they apply mostly to Syrian expats. I will add that the poll was taken over a relatively long period of time (a year+?) during which I believe there was a shift in the views of most Syrians. I wonder if, for example, those who a year or two ago favored US military intervention to help in removing the Syrian regime have changed their minds after the obvious failure of the Iraq operation… two years ago there was no clear conclusion that military force can not turn a dictatorship into a democracy, so I expect that if George looked at his earlier 50 respondents’ results he might find a clear shift in some of the rated variables. But it was a good idea to rely on Conjoint Analysis because Syrians, and Arabs, do not like to answer direct questions about their political views. It will, however, remain a challenge for George to get those living inside Syria to participate. As for the charismatic figures that you suggested as possible leaders of opposition to the regime … you picked two Christians (kilo and Bunni) … despite what many will claim, I don’t think today a Christian can “lead” a majority of Syrians to demonstrate in the streets against their regime. OK, I’m exaggerating a bit, I don’t want to get into that. Prime Minister Ehud Olmert is exploring the possibility of resuming peace talks with Syria through a third party. What is being assessed is what Israel would get in return for pulling out of the Golan Heights, the nature of future bilateral relations and whether Syria would consider cutting its ties with Iran, Hezbollah and Palestinian terror organizations, Israel’s main enemies in the region. Olmert has recently referred to the possible resumption of talks with Syria in closed meetings. “The price is clear. There may be a debate on the payment terms, discounts etc. but the main question is what Israel would receive in return. Will it receive peace like [the one it has] with Egypt, peace like Britain and France have, or a deception: Give us the Golan, and all you’ll get is an alliance between Syria and Iran and Hamas headquarters in Damascus,” he said. Olmert was persuaded to reexamine the Syrian option mainly by the numerous warnings that Syria’s army was gaining strength and the danger of an eruption of hostilities in the North. Alex Sorry to depress you! I remember at Uni having to uplad Wordperfect from DOS mode. Maybe im showing my age of 37 years! Anyway george needs to get on top of these issues! As far as I am concerned it is useless to skew the survey because id bet that over 95% of those that participated are expats, however george can elaborate on that , are the results available in english? Shame on you Alex, I am not Christian and i couldnt care less if these two led Syria, religion should not come into it, they have fine minds and are men of integrity something that is clearly lacking in ME politicians. 1) the results are based upon a small sample and of that, only 25% or so come from inside Syria. So right now, the task is to solicit more participation from inside Syria. 2) such a survey could never give us a true picture of Syrian opinion, because the internet does not sufficiently penetrate the society. However, the information we can obtain through syriapol is light years beyond what we currently have: A bogus referendum that tells us that 99%+ of the people love love love the government, and an opposition that holds demonstrations in DC at which a mere 75 people turn up, having the nerve to hold signs that say, “Bashar, 99.9% of the Syrian people reject your candidacy”. However, I am firmly of the belief that using conjoint is the best way to get information of this type, because it obscures the emotional impact of direct questions, as Camille indicated above. The challenge is that approach is quite out of the ordinary and really pushes people to think in ways in which they may have not been accustomed. I would also like to thank a certain SC reader who wishes to remain anonymous, for automating the analysis. Now, when someone spends 15 minutes to take the poll, he/she will immediately obtain his/her results in the graphical format displayed above, in Arabic or English. The project encountered delays because, for many months, it was blocked from view inside Syria. So, in effect, it was American policy to “punish” the Syrian government by prohibiting its citizens from viewing a website called “A Syrian Democracy Project”. I guess that’s what happens when you put qualified people like Liz Cheney in charge. the results of syriapol ware not accurate for my case.. Sorry, but what is your “case” exactly? the already fragile country and across the Middle East. six months of political gridlock. in the February 2005 murder of Rafik Hariri, a leading anti-Syrian politician. extremist groups in conflicts in Iraq, Lebanon and the Palestinian territories. bombings for most of the past four decades. Lebanon or elsewhere,” said Zalmay Khalilzad, the U.S. ambassador to the U.N.
according to a transcript of the meeting. Qatar and South Africa also abstained. locate it, most likely Cyprus. country, following yesterday’s court vote. Syrian troops out of Lebanon for the first time in three decades. detectives investigating the Hariri murder. That’s why I use European hosting services instead of US ones. In US on-line travel agencies I can’t even find a flight to Syria. Am I the only one having this problem? I do not think Cyprus is a appropriate place for the tribunal,security is not adequate, better place is Austria. Brammertz may leave the process,another one will be appointed in june. Didn’t you hear the speeches of China (biggest country of the world), Russia (biggest European country), Qatar (the representative of the Arab countries) and Indonesia (the representative of the Islamic countries) in addition to South Africa (representative of Africa in the UN)? They all stressed that the reason for abstaining is that this resolution will undermine Lebanese sovereignty and increase violence and tensions “around the world”, not just in Lebanon. So Bashar was not telling Ban some kind of a secret. And of course it was not “a threat” as the hysterical M14 bunch wants us to believe. It is simply common sense (similar to the warnings that Hosni Mubarak, King Abdulla of Saudi and Bashar himself gave to the US before invading Iraq: Terrorism will increase around the world). Any idiot can see that in a troubled country as Lebanon everything will be politicized, take a sectarian shape and eventually lead to violence (take for example, the sectarian demonstrations that took place just after the vote yesterday in Beirut). This is the history of Lebanon in the past 60 years. Any idiot that can read history would foresee regional trouble coming. Outsourcing Lebanese sovereignty to the 15 SC countries (most of which have their own agendas for Lebanon and the region) will definitely increase tensions among the Lebanese themselves, on a regional level and globally. Two, three years from now, you’ll hear a lot of “I told you so”s directed at the US.. again. WOW.. this is an eye opener! I knew that the sanctions were there, but I did not know they cover information and services online. This reminds me of a story that happened to a friend of mine (highly talented Syrian engineer) who recently was head-hunted by a leading American company in the gulf. After 2 months of negotiations he finally signed a contract with them and resigned from his excellent and secure job. When he showed up on the first day in office in his new job, the manager asked him to come to his office and instead of an orientation he was asked to leave the company because he is Syrian and that might get the company in legal trouble back in the US. The rejection for his hiring just came that morning from the US head office and it stated that the company “cannot hire a Syrian national”! Another famous story that shows the US administration’s affection with the Syrian people is the story of professional certificates issued by US companies (such as Microsoft for example) which are increasingly becoming prerequisites in many jobs worldwide. Syrians can attend the courses in centers in the Arab world but will not receive a certificate from the companies even if they pass with flying colors, which is limiting their employability chances worldwide in many job fields. Even the Syrian law does not explicitly deny Israelis the right to work for or access information or services by a Syrian company! And the US administration wants to convince Syrian people that it is on their side, what hypocrisy. I would say any idiot can read history would foresee that regimes have their limitation and when any regime sacrifices the people for his survival, he is the one to be blamed for the chaos. Violence will cause unimaginable human suffering (check out the news on Iraq), regardless of who causes the trouble or who is to be “blamed for chaos” (be it the Syrian regime, Lebanese Zu’ama, US administration or Israel). The resolution will cause more trouble in the region, and when that happens, the ordinary people will suffer not the regime in Syria, not the Zu’ama in Lebanon. Try to justify to the Iraqis their suffering now by saying that it was Saddam’s “regime who sacrifices the people for his survival”! Would it comfort you or make you feel better if someone close to you was killed in violence in Lebanon or Syria if you were told that it is the Syrian regime’s fault?! Thanks for posting the article. Prior to this, all we had was An-Nahar’s article on Bashar’s threat to Ban Ki-Moon. When a 3rd party or an ally warns of violence, that is a warning. When the perpetrator himself warns of violence, that is a threat. When Syria ‘warns’ Lebanon that a Syrian withdrawal from Lebanon ‘would lead to violence’… that is a THREAT. When Syria ‘warns’ that ‘passing the tribunal would lead to violence’ that is a THREAT. When Bashar ‘warns’ that his patron, Iran, has “the capacity to cause disturbances” that is a THREAT. my poll results were OK except for Islamic governance.I think it gave me 60% for islamic governance, and I really don’t think that is the case. I am not sure any of these surveys have any meaning let alone any connection to the reality on the ground. The syrians that have access to the internet are a limited number. The vast majority of the people would not express their views freely. The expatriates have a vision of Syria that is not based in reality. As for the Hariri tribunal, another milestone on the mountains delivering mice. Once again the groups and individuals invloved in the lebanese feuds fall into three categories: the stupid, the traitors, and the stupid traitors. As we read the lis of 10 countries that voted for the tribunal. We should realize and feel the flavor of a European resolution. this means, it will be much harder for the parties involved to avoid any requests by the courts and any future hints of a none compliance points in the directions of future sanctions by the EU!! Not a good picture.I am going to start calling it the “Libyan role”..
Of the 10 countries who voted for this globally-critical resolution to preserve world peace (or is it piece? ), Congo and Ghana are of course the most important. While their delegates were debating establishing a court system that will drive a permanent wedge between the Lebanese and will further distance them from one another, 16,000 children have died of hunger in Africa on that day, May 30, 2007. That is not to count those who died of preventable diseases. I guess dead children don’t count because they never opposed “certain” moderate policies. Lebanon must not go unpunished,” it said. A suicide truck bomb in Beirut killed Hariri and 22 others in February, 2005. Syrian and Lebanese intelligence services played a role. crisis between the Western-backed government and the Syrian-backed opposition. Again, I or anyone else would be a self-deluding fool to think that an internet survey could accurately measure grassroots Syrian public opinion. But at least it is a start and something quantitative, not to mention thought-provoking for those who take the syriapol survey honestly and carefully. The alternative is pure spin from the regime and its opponents. 16,000 children have died of hunger in Africa is an awful fact and must be addressed at the highest level; the world body and African representatives should allocate more time and resources to eradicate poverty and diseases out of Africa. But please keep in mind; yesterday session at the SC was for the establishment of the tribunal to prosecute the killers not to address the hunger in Africa. OBSERVER, maybe you are right, but something is better than nothing. As a start, its great. By the way if someone wants to make money big time, they should start a Polling business in the Arab World. They have to do it in a smart way though, like starting the excercise as a “commercially oriented” (like which you like more Coke or Pepsi, Where do you shop for food.. you know stuff like that, then expand it a bit by bit. Lots of money to be made there, seriously. Across the whole area. BTW A small correction to your remark, you will be surprised to know how many Syrians use the internet, but as far as run-of-the-mill-people are concerned, I would think that the English bit may be keeping them away from actively digging the non-arabic sites. Again, this is a guess only! As if Iraq did not have enough, Turkey now, is seriously thinking to punish Masood AlBarazani. Is the international court set up really to prosecute the killers of Hariri or is it to humilate (capitulate?) regimes for their “non-moderate” policies towards this US administration and Israel’s Likud? We all remember when then Minister of foreign affairs Farouk Sharaa said that 1559 resolution is ridiculous and Syria is not involved. Then few months later Syria had to fully obey it and adhere with it. We see the same scenario again with 1757. As I said yesterday when a dictatorial regime is ideologically bankrupt, economically corrupt and politically unpopular as is the Assad regime it is only a question of times before it collapses. We actually see signs of collapse with these actions and with the shameful statement of the Syrian Ambassador to the UN yesterday. I would hope, It’s set-up to prosecute suspected outlawed institutions and individuals whom conceded to themselves of being untouchables and above the reach of the local and regional law. I would speculate that any regimes, institutions and individuals involved, already very worried!!! Why silent about the vote on the international tribunal? I understand the difficulty of your current geographic location and family relations, but are you able to, directly or indirectly, comment on Mr. Saad Hariri’s CNN interview in which he said that the strongest evidence of Syria’s involvement in Lebanon’s assassinations and recent trouble is indeed their very opposition to the tribunal? If they are truly innocent, what do they have to hide? Lebanon is made up of 4 million citizens in the country, but also of 16 million expatriates who uphold a higher ethics than the murderous, clan-based, ways of some of the middle east. We applaud you as a voice of reason and intelligence having taken not only interest but also family connections in the regions. Please put on back your genuine insight and common sense hat. Expose the horror of secret schemes in Syria. I join Honest Patriot in his request. Why is Syria so afraid of the intl. tribunal? And do not forget I’m not advocating anything here and I’m not on the Security Council neither any Syrian is, I’m just an observer who is witnessing a mess made up by people who do not believe in transparency, they only believe in their own voice. I’m just trying show them there are other voices they should consult with, their civil intelligent people. I wonder if you have an opinion other than their opinion, because keep listening to oneself is not healthy. Bilal, I tell you why Syria is afraid of the international tribunal. Because of the very reason it was established and called for in the first place: destabilize Syria and turn it into another Iraq where sects are fighting each other and the Middle East is forever rearranged in favor of Israel. Or so the planners at the American Enterprise Institute thought. So far, their plans have failed, crashed, and fizzled miserably. Who killed Hariri and the integrity of Lebanon is irrelevant. No one in this Administration or at Likud shed a tear for the murder of Hariri. Syria said that it was not concerned with the Tribunal!! And the US passage of the Tribunal is questionable and has many flaws and irregularities (international & Constitutional Lebanese) that no one should be afraid of it. A pain in the as perhaps, a pressure point as it is intended, but nothing more. Practically and leagally. Let them first finish this investigation and then issue the indictments and the findings, and then select the judges, establish the court, start the proceedings, and we will see. Al Haeieeea’a is nice to know after all. If it can ever be reached. I for one am relieved that this fiasco is finally over. Let us see what “new” things they can come up with now (I mean the Feb14, Supporters & Co.) since this card is “used” allready. You may wanna tell Josh what to have for Breakfast on Saturday as well. If you “know” what you want Josh “to say” why even bother? It is nicer to have a Second opinion from Josh. But does it have to be similar to the First opinion, or are you having doubts about this and want to be re-asuured by Josh? First, Syria is not afraid of the Tribunal. Bashar & company are. Second, the reason you gave about turning Syria into an Iraq is exactly what the regime is brainwashing Syrians so they would stand with the regime against the tribunal. A good majority of Syrians are not buying it and they know that Bashar is a criminal and do not mind prosecuting him. Who would defend a corrupt murderer? Syria definitely deserve better. Then it is not who killed Hariri but who think he has the right to kill & conduct any policy and get way with it? Maybe in the past it was possible but today Syria has lost a lot of cards that cannot afford to do it anymore but Bashar is so inexperienced that he is not realizing this simple fact. That is why he is getting deeper & deeper in …..and still he does not realize where he has put himself. It is not the US passage but the: US, France, UK, Italy, Germany, Belgium, and a lot of other Arab & world countries. Trust me if the investigation did not have enough evidence against Bashar & Co. the UNSC would not have done all of that in order to establish the tribunal. Remember that Jamil Alssayed who was the most powerful man in Lebanon is still behind bars for more than a year now. If there were not enough evidence do you think they can afford to keep him? Read all previous reports by Mehlis & Brammertz. Read between the lines. It clearly points the finger to Bashar & Co. in many points. There is no doubt they have all the evidence they need especially when Brammertz in his last report pleaded for the establishment of the tribunal ASAP. We are almost there and we have crossed the half way mark and the Al Haeieeea’a is at eye sight. Thanks for your response: the key I think is still to gauge Syrians residing in Syria, this is the key and crtical to know what the population wants and feels. I admire the work that you are doing, it is progressive it is only through research and dialogue we can move forward. You will always get the KNOCKERS who disparage your work no matter what it is. Mr. Saad Hariri’s CNN interview in which he said that the strongest evidence of Syria’s involvement in Lebanon’s assassinations and recent trouble is indeed their very opposition to the tribunal? If they are truly innocent, what do they have to hide? The tribunal has been advocated by USA which is fiercely against her citizens to be trialed in international courts. USA has taken big steps in undermining the international courts and making bilateral agreements with several countries (Micronesia, Romania, Iraq, Jordan, Israel, East Timor, the Marshall Islands, Afghanistan, Honduras, Uzbekistan, Mauritania, Dominican Republic, Palau, Tajikistan etc excellent archetype democracies) which guaranty impunity for United States (US) nationals who have been accused by the International Criminal Court (ICC) of genocide, crimes against humanity and war crimes, including crimes committed on the territory of other states. The valid question is what has USA to hide and for what is it afraid. USA advocating international tribunals for others (naturally) is mildly said hypocritical. The Hariri case tribunal should be a future international standard for equal events, otherwise it is only a political crusade against a “suitable” target which has very little to do with justice. Next time Israel assassinates an Arab politician let UN put up a tribunal to check Israel’s evidence about the claimed “terrorism links”. The “tribunal justice” must equal to all. On the other hand now when the tribunal is almost established it could enlarge its mandate also to inspect the events in Sabra and Shatila massacres. It would save costs and would also serve justice for Lebanese and Palestinians. The sad thing is that USA, Israel and portions of the March 14 movement are most certainly not wanting to find out the truth in that event. what a victory! a bitter victory for the 14 march group. They keep claiming that it is a victory for all, come on.. when this tribunal is put down the throat of 30 to 40% of the lebanese, how can it be a victory for all!! And now they expect that the opposition will come and sit with them , smiling, come on , Hariri wake up! “It is said Fatah al-Islam is linked to Syria. To Syrian intelligence. This is exactly what I have heard from the interrogators [of 20 arrested suspects]. That there are some connections with some Syrian intelligence. Now whether these Syrian intelligence [operatives] are working on their own, or guided by higher superiors, I don’t know. We’ll have to find out. Further, Hakaymah assures that the group seeks only the benefit of Muslims and “liberating” Palestine, and reports and rumors in the media that state otherwise are mere lies intended to deter Muslims from supporting Fatah al-Islam. I agree, the key is not expats but Syrians inside Syria (even though internet users do not represent the overall population, but something is better than nothing). So far expats account for over 75% of the responses, which is why I didn’t publish any hard numbers yet. This press release marks the beginning of a push to get more coverage in the Arabic media and websites. If anyone wishes to help push the site on bulletin boards, news sites, etc. that are frequented by Syrians, please let me know – george@ajjan.com. engaging Syria mean for building a liberal future for Lebanon? to establish a similar tribunal within Lebanon were stymied by Syrian allies. intermediaries were trying to reconcile him. continue to hit back to save themselves. Command and Fatah al-Intifada, from which Fatah al-Islam allegedly broke off. visit to President Bashar Assad, all for precisely nothing in return. Islamist it has co-opted, Fathi Yakan. Lebanon to ward away the menace of the Hariri tribunal. from Syria but from the Siniora government. This was his way of implying that the latter was worth discarding. For Mr.
they disregard Syrian responsibility for that instability. and continues to detain thousands of political opponents in its prisons. crisis on an al Qaeda affiliate allegedly financed by the Lebanese government. a tribunal the Syrians fear. have to wonder whether its regime can be a credible partner to the U.S. According to Al-Hayat, the person arrested in a hotel in Ashrafiyeh is a Lebanese citizen, “Ahmad M.”. Naharnet, quoting “reliable source”, had reported that the man is “a national of an oil-rich Arab country” who used “two forged Lebanese identity cards, one identified him as Hagop and the second identified him as Ahmed Merie”. The same “Lebanese security source” is quoted by DPA confirming “that the arrested man is a Saudi national”. In contrast, As-Safir had also reported the arrest of a Lebanese citizen. They’re not talking about the same person. You misread it. Boomerang” wa ala albaghi tadoor el dawa-er”. the difference between Bashar and Hafez,is not their atribute,AND PERSONALITY, BUT RATHER THE INTERNATIONAL ENVIROMENT.